Invayt (Invite) translates to English as an invitation. In this article we take a closer look, which invites use, how to obtain and use, as well as talk about the invite code. Not all Internet resources can free up. Some services are "filtered" its users and do not let the intruders. To become a full-fledged user of this site to get invayt - an invitation from any of the existing users of the service. Such resources enough: it online game, and forums, and social networking sites and some other websites. Get invite a variety of ways. 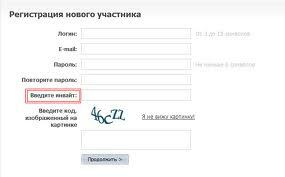 most legal (according to scheme idea) - it is an active participant in the invitation site. This can be your friend or a stranger in real life people, who sees, that you are "in the know" and you will be on site. Also, you can invite win a prize or bonus. can invite barter for another invite at a special stock exchange. For example you have an invite to the forum A, and you need an invite to play in. You find a person exchange, which has an invite to play in, but who needs an invite to the forum A. Then follows a mutually beneficial exchange. by the way, presence, invite itself does not guarantee registration in the resource. As a rule the administration of such sites monitors its reputation and pretty tough weeds out the "superfluous men". To register on the site using an invite, enter invite code. If it fails to do, Use a certificate on the site, or (if possible) ask the person, who sent you the code. After registration and entering the code, you can start to fully use the resources.